Im a Fan of Everything Ice Cream LLC... Are you? Fill in the below form and you can recommend ‘Everything Ice Cream LLC’ to a friend or family member via a text message. Show your support with a quick share of ‘Everything Ice Cream LLC’. We are a unique, locally owned ice cream parlor located in Anna Tx. We have 30 plus flavors of ice cream available with a varietyof dairy free products. In addition we have a mobile ice cream parlor available for private parties such as birthday parties, family reunion, church get togethers, HOA events, company picnics, sporting events, graduations, and any celebrations. Awesome people and an awesome place!!!! Best ice cream place I have ever visited, definitely travel worthy, and phenomenal customer service! Love this place. Always super friendly and of course the ice cream is great. Great employees who are helpful and passionate and ice cream that is delicious! Thus has been an amazing addition to the city of Anna. The ice cream is always delicious and their sundaes are unique and do not skimp on the toppings. The staff always has a smile on their face and treat every single customer as a friend. 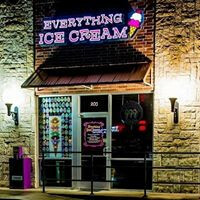 Everything Ice Cream is a special store to me because it is a local family owned business. They have such a great passion to serve this community by providing a fun place for families to enjoy. They have the yummiest and most creative treats in town! And they will make pretty much anything ice cream that you can dream of! They deserve to win the Fans Choice Award for 2017!! This parlor is so very awesome and unique, the sweets are fabulous, the customer service is hands down the best, they have a huge variety and it is all so very delicious. I love treating my kids, husband, and myself to a wonderful treat. And there open late so it has become a late night date night hang out as well, we sneak out after the kids have gone to sleep so we don’t have to share! Great place and the owners are really nice!!!!! I love the Owner! She is so friendly and caring! I love their ice cream and Italian ice! Everything I’ve tried has been awesome! Sub an amazing shop with the best owner! You are instantly welcomed and want to hang out. The ice cream is some of the best I’ve ever had, with toppings for days! Even on my “diet” I visit often. They have the best selection of ice cream and are always energetic and excited when you come in! Always great service and staff super friendly! Great service and the best ice cream! They opened a little over a year ago and are such a great addition to Anna, TX. Shop is bright and cheerful, ice cream is awesome & owners & staff are always so friendly. Shop has a lot of different ice cream flavors, bars, sno-cones, sundaes, hand scooped milk shakes & a ton of different toppings. Everything Icecream has absolutely delicious icecream as well as something for those who can’t have dairy. They have fun additions to their regular items like candied apples, sandwiches made with donuts and your choice of ice cream/sorbet and the huge icecream challenge. They are mobile as well for special events. They also are supportive in the community. They are Fantastic and deserve this award!